…for full instructions on how to knit check out my DVD on How to Knit. To start to cast off, slip the first stitch from the left hand needle to the right hand needle. 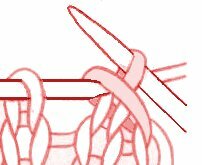 Do this by putting the needle into the first stitch as if to knit it and pull it off the left needle. Taking the point of the left needle, insert it into the slipped stitch on the right needle, from the front and from left to right. 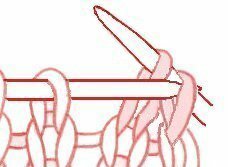 Carry that stitch forward over the second stitch on the right hand needle and off. You have just cast off the first stitch. Now you need to knit the next stitch so that there are two stitches back on the right needle. Again, using the left needle, pick up the first stitch and lift it over the second stitch and off the needle. You have just cast off your second stitch. Carry on casting off one stitch at a time like this until you reach the last stitch. Cut off the yarn leaving about 6 inches for sewing in and pull the end right through the last stitch. That’s how to cast off on a knit row. Sometimes you will need to cast off in purl or in rib. In these cases the principal is exactly the same. 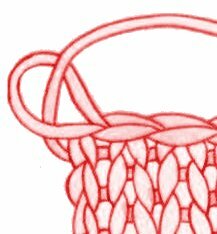 Make the stitches, either knits or purls, and lift the first stitch over the second one at a time as above.